Hauppauge High School recently held on October 2nd, a very special fundraiser that is dear to their hearts. 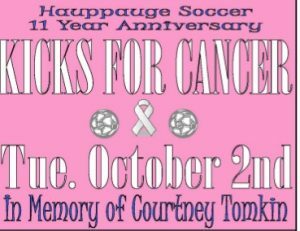 “Kicks for Cancer” began at Hauppauge High School in 2008 as a way to honor and support Hauppauge HS student, Courtney Tomkin, a Junior who was diagnosed with brain cancer the previous Spring. The summer after Courtney was diagnosed, Hauppauge Girls Varsity Soccer Goalkeeper, Alexis Gonzalez, went to Jessica Kulesa, her coach, asking how the team could put something together to help Courtney and her family. It was during that conversation that “Kicks for Cancer” was born. The following was written by Courtney’s father, Daryl Tomkin: “That fall, she ran out onto the field facing an uphill battle. You wouldn’t have guessed by the big smile on her face as she greeted her teammates in the middle of the field. It was the day her friends and this community stood by her side and developed “Kicks for Cancer”. This community was a place she loved to call her home. “Kicks for Cancer” meant the world to Courtney and to us, her family. Courtney was brave and courageous beyond her years and she knew that her time here was going to be cut short. We are all put to Earth for our life for however many years it is. For Courtney, it was a life that had hardly begun, but that’s not how she described it. For Courtney it “was 17 great years”. Our daughter, your sister, your friend, your student, taught us to look at the world through better eyes, to take time to enjoy life’s simple joys. She set about creating special and memorable moments. She made every day count. “Kick’s for Cancer” allowed her to see just how much love she was going to take with her. Courtney’s life ended on December 13th, 2008, but she left us a lifetime of fond moments, precious memories and so much love. Our life as a family will be forever changed and our hearts broken for having lost a daughter and a sister as special as Courtney. We take pride in knowing, however, that her life meant something to all of you who share in this event. So we wish to thank you for making this event in honor of Courtney, and for loving her and missing her as much as we do. Courtney was so proud of the Hauppauge Girls Varsity Soccer Team. Their love, generosity and friendship were unbelievable and meant the world to her. 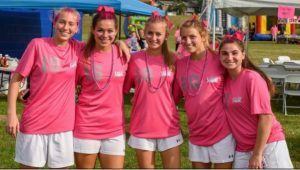 We hope that Kicks for Cancer continues to grow, that the proceeds will benefit other children suffering the terrible tragedy of Cancer, and that someday this charitable event will help in finding a cure.” This event has become incredibly successful, growing more and more each year with the help of our entire Hauppauge Soccer family. The money raised by the event is split amongst American Cancer Society, American Lung Assoc. Making Headway Foundation, and Make a Wish. Funds were raised in many ways. “Bounce Bracelets” were sold for unlimited Bounce rides, obstacle courses, slides and more. Face painting was included. Raffle Tickets were also sold. Also available for sale were sweatshirt hoodies, sweatpants, t-shirts, blankets and sunglasses. Thank you to everyone who attended and supported this worthwhile event!